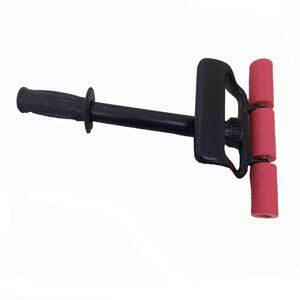 Fully extendable hand roller designed for use when fitting vinyl flooring or Karndean flooring. Apply maximum pressure when laying vinyl flooring into adhesive to complete a professional looking job that will last for years. Perfect for laying Karndean flooring tiles and wood planks especially where complex patterns are concerned. Save £s on buying a 68kg roller which is recommended for rolling new flooring. This extendabel hand will give the same pressure per square inch as a large very expensive 68kg roller. Vinyl flooring tool scribing bar to back mark from the wall on to your vinyl flooring before cutting with a perfect fit. A versatile tool for precision marking and cutting. Only £38.99 Free delivery. Blades suitable for use with most fitting knives. Straight blades, hooked blades, concave blades and super hooked blades. For use with laying carpet or vinyl flooring. Finish the job like a professional. Karndean Flooring versilay floor preperation system at low prices.The perfect adaptable sub-floor preparation system for all types of projects. Beautifully made dividers for flooring. The easy way to back mark your flooring for easy cutting. Karndean 2 part epoxy adhesive For use in areas subject to excessive moisture such as wet rooms and extreme heat areas like conservatories. Karndean flooring adhesive ideal for large scale areas. Buy upto 15 litres for 75 sq m coverage. Seam Roller for use to roll seams on vinyl flooring. With a polished steel roller and a shaped wooden handle for an easy comfort grip when joining the seams of your vinyl floor. Full box of Stikatak hammer tacker flooring staples suitable for use with the NJ51-R11 hammer tacker and many other hand staple guns.